I remember my first few weeks with Haiden, my first baby. While he was a good, happy newborn, I just couldn't understand his sleep patterns. He'd fall asleep in my arms, then wake up the second I put him down in his bassinet. He'd be awake for hours, then cry for a good long time before finally giving in and falling asleep at night. His naps also mystified me: I thought newborns wanted to sleep all the time, but he would fall alseep, then wake up after 20 or 30 minutes. I'm someone who believes there's an answer to everything, as long as I look in the right places. I remembered watching a short snipped of The Happiest Baby on the Block DVD in our hospital “getting ready for baby” class, so I started with the corresponding book. After those techniques worked, I found a few other books that were incredibly helpful! Note: I totally understand that new parents (and parents-to-be) are incredibly busy! I found audiobooks to be a lifesaver for those first few months. I'd just keep the CD and/or my iPod set in my car and listen to them as I could. I've taken many 3+ hour car trips with my babies, and audiobooks for me were fabulous for the times when the babies were really little! Right now, all the books are available in audiobook format. 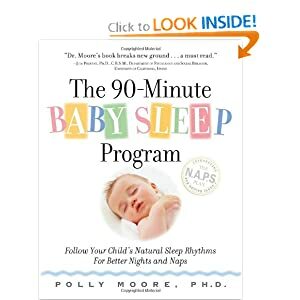 The 90-Minute Baby Sleep Program (by Polly Moore, PHD) :: New from $9.95, Used from $2.31+shipping :: A fabulous Early Childhood educator recommended this book after I expressed my frustration with Haiden's short naps. The book is based on the idea that newborn babies can only be awake for 90 minutes before needing some rest. There's definitely some misunderstandings with the title of the book: this does NOT mean that babies need to sleep every 90 minutes! The author outlines a simple routine to get baby stimulated, fed then asleep, and the routine should be repeated throughout the day. This book is a quick read and it's at the top of my list for recommended readings for new parents! 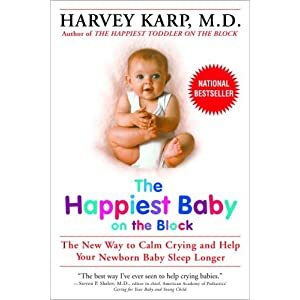 The Happiest Baby on the Block (by Dr. Harvey Karp, MD) :: New from $10.20, Used from $2.44+shipping :: This book is intended to help you understand your baby's needs in the first three months (referred to as the “fourth trimester”). The book is very kind and sensitive to babies, who have very unique needs in the first few months of life. Also, this book is great even if you don't have time to read the entire thing. I'm pretty sure I only read the first few chapters to get the information when I most needed it! Secrets of the Baby Whisperer (By Tracy Hogg) :: New from $7.99, Used from $1.86 plus shipping :: The books tagline is “How to calm, connect and communicate with your baby.” While some of the Amazon customer reviews are a bit harsh, I think we're all intelligent enough to take the information we want to heart and discard what we don't agree with. Personally, I didn't have any issues with the book! I loved how the author outlined how to approach and talk to your baby, and I also loved her suggested routines for better naps and nighttime sleep. Finally, the author provides some guidance on processes that new moms might want to know more about, from bathtime to feeding. Those are my top three for newborns. 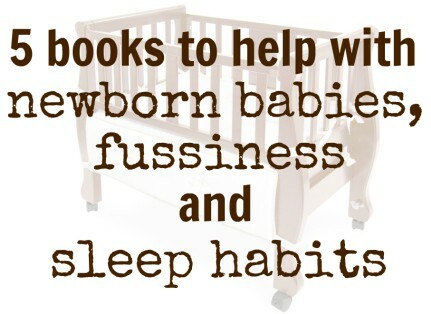 I do have other books that I liked when it came time to work on Sleep Training, but these ones are intended for reading before that! 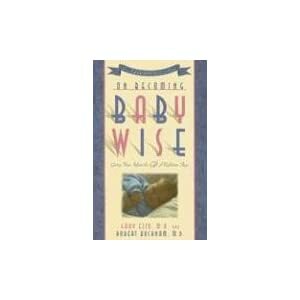 On Becoming Baby Wise (by Gary Ezzo) :: New from $7.93, Used from $1.24 + shipping :: I know that this book is controversial, but a lot of parents love this book! Commenter Susie knows over 10 parents who have been very successful using the methods in this book, and commenter “ShorterMama” explains that the book teaches you how to get your baby on a routine/schedule from day 1. 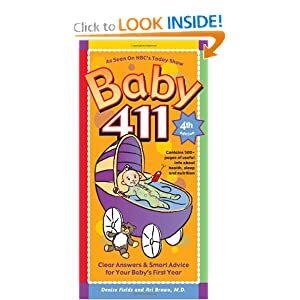 Baby 411 (by Denise Fields and Ari Brown) :: New from $10.17, Used from $8.16 + shipping :: Eliza said that this book is like a “reference manual for babies.” She also said that Toddler 411 was useful starting as early as 9 months! 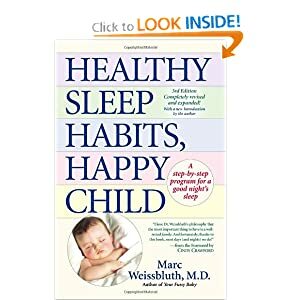 Healthy Sleep Habits, Happy Child (by Marc Weissbluth) :: New from $16.47, Used from $14.95 + shipping :: I thought that this book was primarily about sleep training and “crying it out” for a certain period of time, but reader Kate encouraged me to look at the book again. It turns out that many customer reviewers recommend reading this book when babies are newborns to get to know their sleep habits as quickly as possible! Do you have any books you recommend for brand new parents or parents-to-be? I also highly recommend Healthy Sleep Habits, Happy Child. Such a great book for sleep deprived parents! Thanks, Kate! I’ve been under the impression that that’s a Sleep Training book. Do you think it’s appropriate for newborns? “Happiest Baby on the Block” saved my life…using the tips in that book increased my son’s overnight stretches of sleep from 2 to 5 hours the first night. It’s an easy read…I highly recommend! “On Becoming Baby Wise” was my life saver. Everyone I know (at least 10+ people) that read the book and actually follow it have babies that sleep thru the night and take/took their naps. Everyone always says I have such a “happy/smiley” baby, and I think that has a lot to do with her getting her naps on time and she get’s LOTS of sleep at night (about 12 hrs). The only time she wakes up at night is when she’s sick (like tonight =( or teething really bad. Plus it goes into other areas of parenting, not just the sleeping part, I loved the whole book! I agree with Susie. On Becoming Baby Wise has been wonderful. Started with it day one – which no doesn’t mean you’re letting a 1 day old baby cry it out – it means you WAKE a sleeping baby in a routine to kind of set their schedule and tummy to know when to want to eat. It also gets them used to getting up during the day and sleeping during the night. My little guy was sleeping through the night (6.5 hours) around 8 weeks, sleeping 8 hours around 12 weeks, and now at 4 months is sleeping about 11.5 hours at night. What a blessing!! I highly recommend Baby 411. This book is like a reference manual for babies. It is set up to quickly look up several things, such as rashes, fever (broken down by age groups) and how-to’s (like taking a temperature rectally). They also have Toddler 411 which can come in handy as soon as 9 months. Thanks! I’m going to update the post with links to the three books suggested. I really appreciate your input!